Travel journalling is HARD. Every time I try to keep a regular journal on the road I give up- it’s way too much effort. Bullet Journalling, though, has been a perfect companion to travel. Most of us take lots of photos when we travel, but I created this layout to record the experiences and memories that photos can’t quite capture: bringing experiences of all five senses into a layout that can be quickly jotted down over breakfast or a coffee break. Scroll to the bottom of this page for instructions to download a printable template. Why Bullet Journalling over Long Format? You probably know the drill: You pack a journal for your trip, make a plan to journal faithfully all the memorable details of your travel destination, and inevitably the journal returns home stuffed under a pile of dirty laundry with a few scribbled pages at best. So what if there was a better way to travel journal? I think that way is adapting the bullet- type journal to travel journalling! Maybe you have already experimented with bullet journaling as a speedy way to record important events, thoughts, and to-do lists, or maybe you are completely new to the bulleting style of journalling- my travel bullet journal style layout works great for bulleting pros and amateurs. Bullet journalling is increasingly associated with elaborate photogenic spreads created painstakingly for social media- but don’t be thrown off by these complex layouts- your journal does NOT have to be pretty to serve as a tangible record of your travel memories. Travel Journaling feels like a way to remember everything that my photos cannot capture: my camera roll records sights I saw and a few faces of people I met, but the photos never capture the essence of a place in the way that a few words in a journal can capture. In fact, research indicates we remember things far better when we describe them than when we take a photograph. 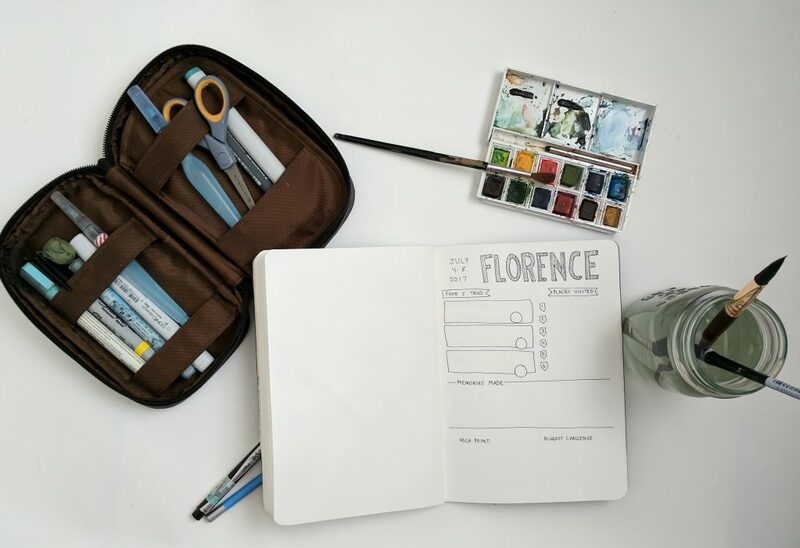 When I set off on my first solo international trip, I had the chance to experiment with several different methods for keeping a journal on the road from Italy to Bosnia and back. Previous trips attempts at travel journaling would find me exhausted in a hotel room after a long day trying to write paragraph after paragraph of the day’s experience. It wasn’t fun at all, and I have never once looked back over the long format journals kept during those trips. Experimenting with different formats of travel journaling helped me figure out what works for me. 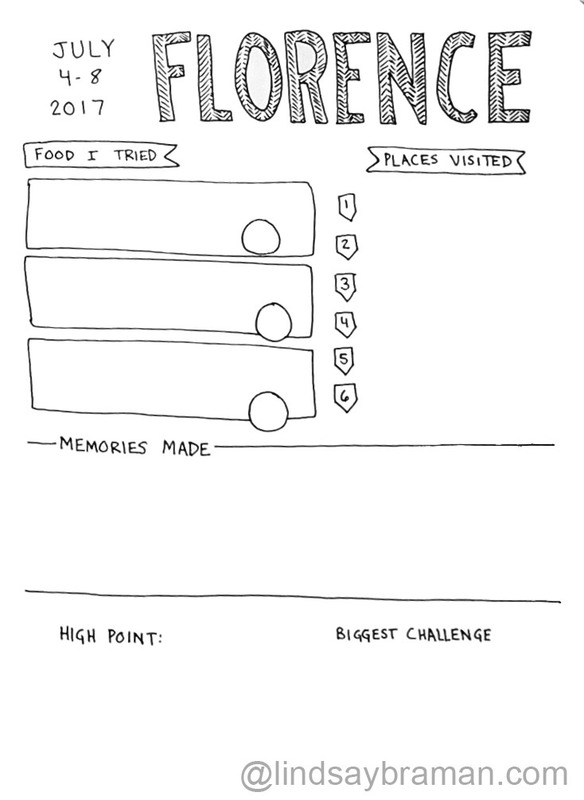 It turns out, two formats work really well for me: 1. an art/doodle style visual travel journal, and 2. a bullet journal layout specifically made for capturing the meaningful moments and experiences of traveling- without the time or energy investment that long format travel journals require. After experimenting with various layouts while I was in Italy, I created this minimal version. Staying minimal is important. If you have the time, and it brings joy, you can embellish your layout with sketches and illustrations of things you see on your travels, but for me, I find it helpful to keep my art and my bullet journal separate – or at least on separate pages of the same notebook. When I sit down to bullet journal I want to be able to collect my reflections and memories and no more than 10 or 15 minutes. 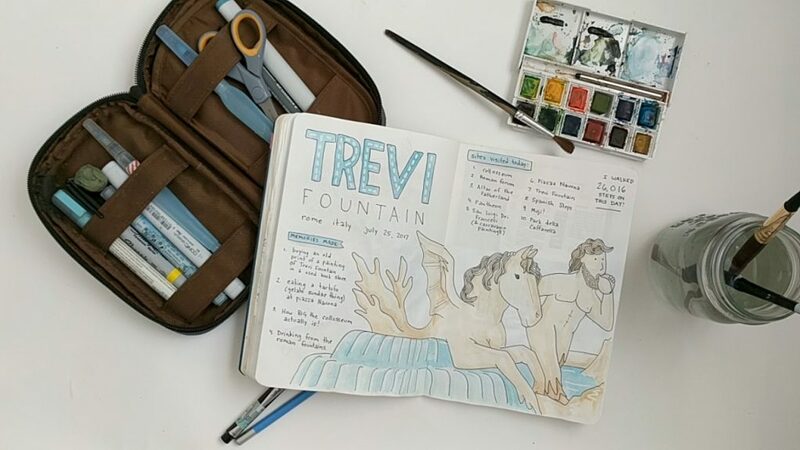 This means more time for adventure and less time stressing over making my journal pretty – in fact, the reavel layout pictured here is a page I created after he came back. HINT: My bullet journal – like most real people’s- is a mess. I find layouts to be helpful for planning and organization, but also know that mistakes and overflowing sections are part of the process. I make my bullet journal work for me, not the other way around. A recent University of California study revealed what psychologists suspected: taking a photograph of something actually decreases your mind’s ability to remember the thing photographed. However, mindfulness was shown in a study by UC Santa Barbara to improve memory and recall. Why do I mention this? Because of journalling, which by definition is a process of mindfulness, actually changes the way you remember and integrate your expereinces during travel in a way that photographs cannot. To help you take a few moments to mindfulness to mindfully reflect on your travel, this layout invites you to journal things that your camera can’t catch: The flavor/scents/textures/sounds of places you went, reflections on meaningful experiences, your favorite part of the day, and the moment that most challenged you. These five categories make a balanced layout that is so fast to fill out and a great way to quickly record a travel journal in a bullet style format while you are on the road. I hope this #travelbujo layout and thoughts on why journalling matters have been helpful and inspiring. You are free to create, build, and reimagine for your journal based on this layout. If you’d like a template PDF to print on cardstock, cut out, and use in your standard-sized bullet journal to make lightning-fast pages, the print-ready PDF template shown below can be downloaded via Patreon for the cost of buying the artist a cup of coffee.